There’s a strange paradox at the heart of our treatment of death. On the one hand, we’re surrounded by it. 24 hours news channels spew out the numbers, names and circumstances of the dead; an endless stream of murders, casualties, epidemics. But on the other hand, death as a reality unmediated by a screen is shrouded in silence and ritual. Death is everywhere and nowhere. This is the backdrop to Am I Dead Yet? Making a show “about” death opens up a vast range of possibilities; as someone commented to me after the show, it’s like making a show “about” life. Wisely, then – and a tad ironically, given their name – Unlimited Theatre have established limits to their scope. Their starting point is twofold. Firstly, they acknowledge that particular tight-lipped uneasiness that surrounds death and its invisibility while in plain view. Secondly, they fasten onto the idea that, thanks to advances in medical science, death might now be better thought of as a process – and, increasingly, a reversible process – than as a single moment in time. If our idea of death is changing, they reason, then we’d better start talking about it. Double act Chris Thorpe and Jon Spooner have multiple strategies for starting that conversation. Part Grim Reaper, part storyteller, part clown, each performer approaches the subject of death with both humour and seriousness. The structure, for the most part, is governed by a pair of interlaced stories and a series of musical interludes. Electric guitar snarls defiance towards death; voices gently, lyrically tell of two coppers finding a severed head, or of a little girl slipping unobserved through a sheet of ice. 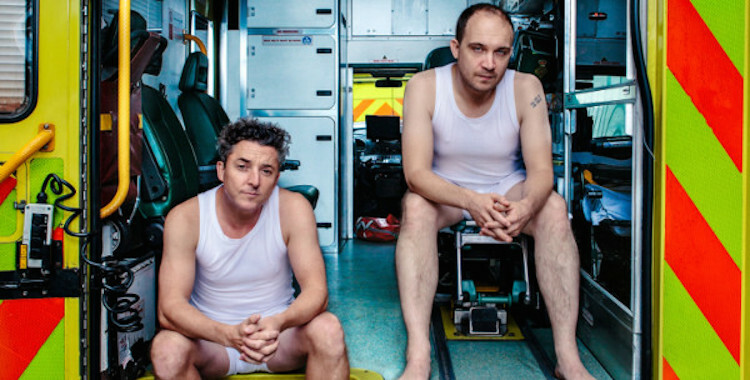 In between, Thorpe and Spooner offer facts about the process of the body shutting itself down and a guest paramedic performs the best CPR demonstration you’re likely to witness. The science that Unlimited draw on, while sometimes sounding far-fetched, is – either brilliantly or terrifyingly, depending on your perspective – steeped in research. It is now technically possible to raise people, Lazarus-like, from the dead. But rather than looking too closely at the science itself, Unlimited are more interested in what this might mean for us as human beings – not medically, but psychologically, socially, politically. Most compellingly, they raise the all too plausible possibility of a society stratified according to access to life-extending technology. What happens when death is no longer a reality for one portion of humanity? Rather than penetrating much deeper into any of the ideas they raise, however, Unlimited leave the extra mental legwork to us. Small details open up spaces for thought: the involuntary laugh of a policeman clutching a human head prompts reflections on our often unpredictable emotional responses to death, while the possibility of snatching people back from the dead provokes an unspoken question about what happens to that part of ourselves that makes us who we are. It’s refreshing – if a little scary – to have the room for this kind of thinking created in public. Still, some of the individual threads could be pulled a little further; as it currently exists, certain elements of the show feel as though they stop just short of the idea they are reaching towards. Or perhaps that’s the point. There is, however, something appealing and surprisingly optimistic about creating a communal space in which we might be able to begin confronting and talking about death. And if we can get better at dying, maybe we can get better at living too.